If you are looking for a gas powered riding lawn mower for a small to medium size lawn then you might want to have a look at the Weed Eater WE-ONE which is considered to be the best riding lawn mower for a very reasonable price. Continue reading below to learn more about this gas powered riding lawn mower. The Weed Eater 26-inch riding lawn mower has a total of 3+1 speed transmission, 3 for forward and 1 for reverse. It also has adjustable height of the cutting deck. You can adjust grass cutting heights from 1.5 to 4 inches. This gas powered riding mower has a turning radius of 30-40 inch. The riding mower has a very comfortable padded seat for additional comfort. The mower is only 36 inches wide which makes it one of the very few small riding mowers that can easily pass through any yard gate. The engine on this automobile is 195cc Briggs and Stratton 875 series. 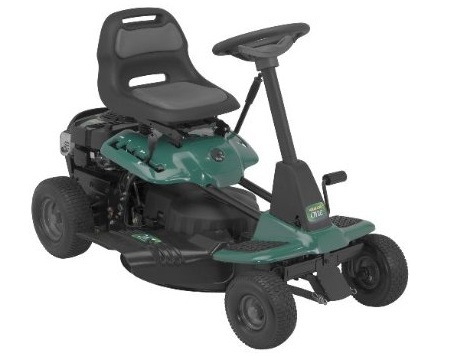 The gas powered riding lawn mower has non-slip foot rests plus it has electric start so you do not have to put any effort in starting the engine. The mower in Non-CARB compliant so if you live is California, this one is not for you. You will have to have a look at CARB-compliant riding mowers. The mower weighs 196 lbs and has a very compact design with engine at the rear end. This riding mower also has a 3-inch blade adjustment feature. For those looking for a small riding lawn mower for a very affordable price, this one should fit in their budget quite easily. The Weed Eater gas powered riding lawn mower is available at Amazon.com (with FREE shipping) at a special 13% discount price till stock lasts. You can also browse the list of other best selling riding lawn mowers. The list is updated every hour.